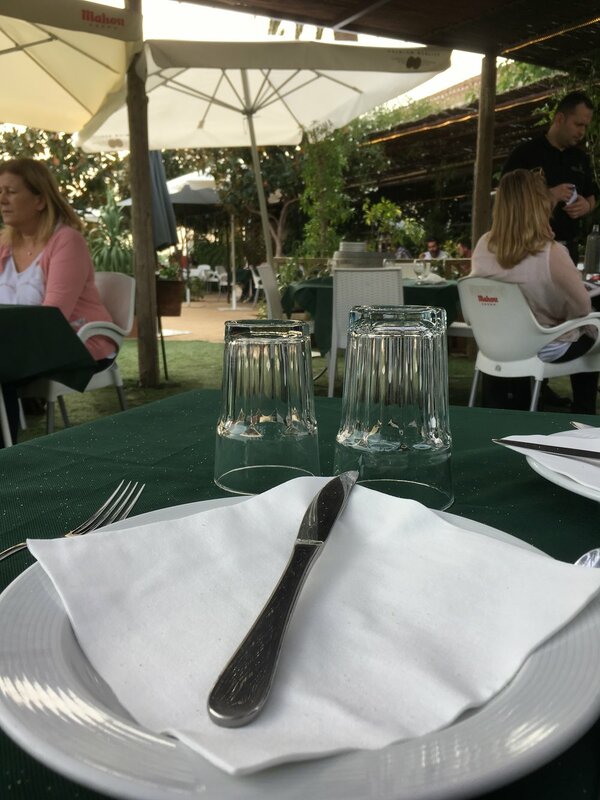 We are sitting at a table on a patio out in the middle of the fields on the outskirts of Valencia, Spain. Right around noon, we set out on a walk from our loft apartment in the historic district headed for one of the city museums. As we walk through narrow streets, large plazas and green areas, we soak in the vibrancy all around. People are deep in conversation seated at outdoor cafes, dog owners walk their dogs, buses pick up passengers at the bus stops, and a steady stream of city traffic glides by. Spanish voices mix with the squeal of brakes and an errant horn or whistle. Though we reach our destination and enjoy the one hour perusal through the museum, we decide to go a little further. Right on the other side of the boulevard lies the very modern City of Arts and Sciences. Designed by the architect Santiago Calatrava, these organic looking buildings edged with water glow in the Valencian sun. As we stroll alongside these giant shapes and arches, we look at our watch and realize that it’s already 2:30. That’s not too late for dinner here on the Mediterranean. 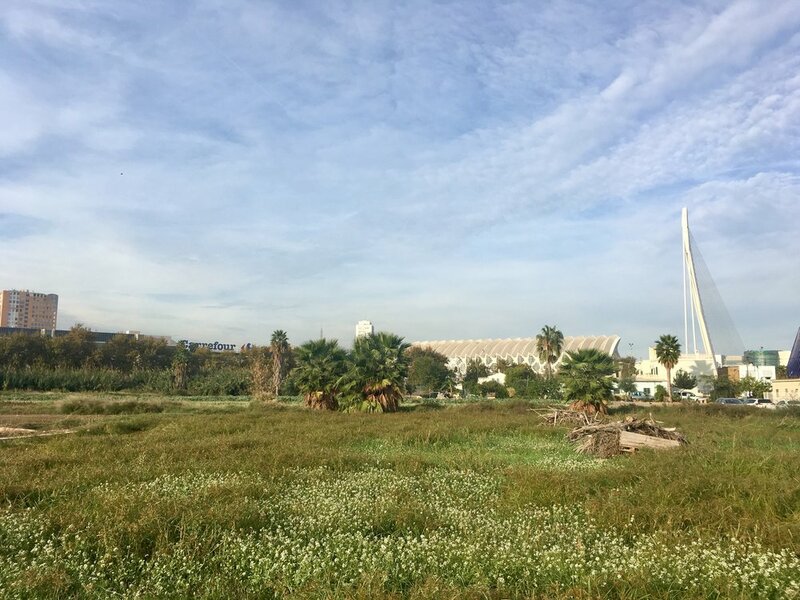 I’ve heard of a restaurant that is a fifteen minute walk from here, out in the fields, that serves great paella, the traditional rice dish of Valencia. We look at each other and decide to go for it, hoping we don’t need a reservation. To get there from here, we cross one of the busiest traffic intersections of Valencia and then follow a large boulevard with never ending cars. Suddenly, to our left, the buildings turn to fields and a small metal gate gapes open at the top of stone stairs. We head down the steps and follow a path through the artichoke fields and out to a narrow country road. 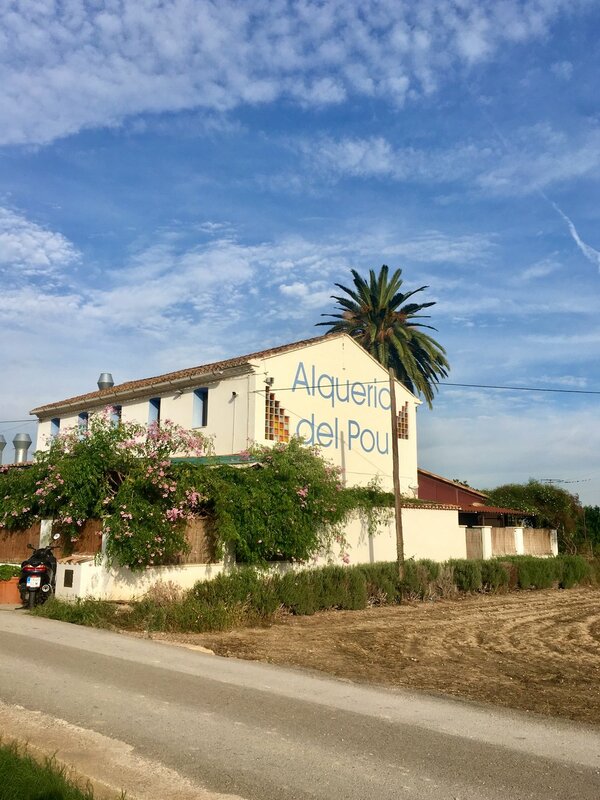 A couple hundred yards down the road, we see a name on the side of a large farmhouse with flowering vines around its doors, Alqueria del Pou. This is the place! We walk in the open front door and through a porch filled with occupied tables, into the hall where we are immediately greeted and welcomed and shown through to the back patio. The place is busy, and everywhere I look, I see people, enjoying their noon pause as they eat and drink. The buzz of conversation is lively and warm. We order our drinks and our food, including a chicken and rabbit paella that comes in a large blackened pan. As we eat, we join the hubbub. 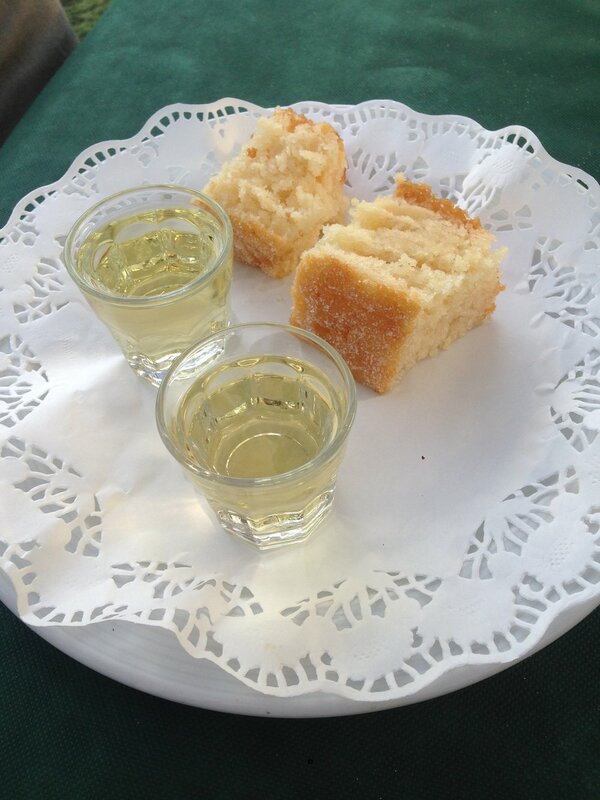 At the end of our meal, the waiter brings us a complimentary platter of cake and local liqueur. The two tables next to us receive some as well. All of a sudden, we are up and out of our chairs, toasting each other, in Spanish, Catalan, English and Italian. We clink our tiny glasses and take a sip and raise our glasses, smiling and laughing. Then we all return to our own conversations. And then, each take leave. 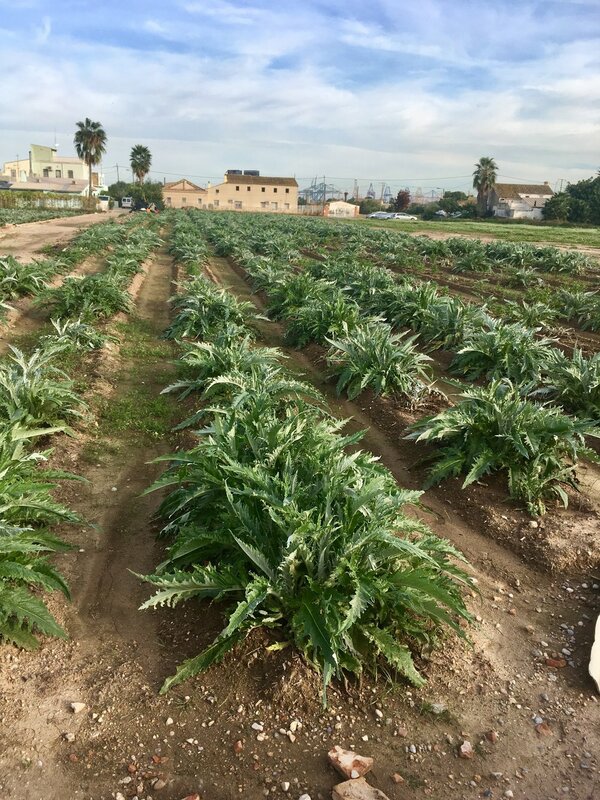 It’s time to walk back through the artichoke fields and back to the city just beyond. As we point our feet home, we carry with us the warmth of human connections beyond the political or religious or the he said/she said. 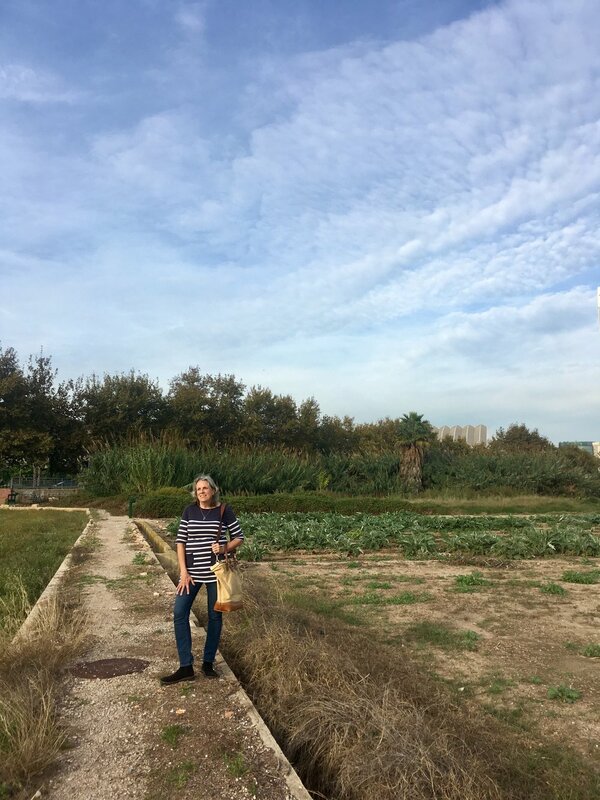 Out on the outskirts of Valencia, amidst the vegetable fields and citrus trees, many of us gathered to eat good food and enjoy this life right here, right now.